The New Manchester Gallery Hopes to Provide a More Diverse Space for Richmond Work | Arts and Culture | Style Weekly - Richmond, VA local news, arts, and events. Scott Elmquist The new Manchester Gallery at 1409 Hull St. hopes to provide a space for artists who may have trouble getting their work in other, more established galleries. The concept is cool: a pay-to-play art gallery on Hull Street where artists, designers, authors and musicians may house and market their work for a monthly fee, with all of the sale proceeds passed directly to the creators. Manchester Gallery founder and owner Adolphus Ingram says its goal is to expose a wider swath of Richmond talent and create opportunities for artists to thrive and be celebrated in their own town. The space at 1409 Hull St. is primed for its Oct. 20 opening: The pristine interior walls are stark white and lined with the work of dozens of Richmond visual artists. Wilma Flintstone poses in a quirky piece by Ciera Smith. A profile painting of W.E.B. DuBois by Champ depicts the renowned black scholar in deep deliberation, sharing space with a textured, wildly-colored abstract creation by Ingram’s daughter, Nayeli. It’s clear that Manchester Gallery promotes a range of styles, perspectives and experience. Ingram says that for $40 a month, the gallery will house, market, ship and sell an artist’s work regionally in Maryland, North Carolina, Washington and Virginia, and the artist will receive 100 percent commission on all sales. Manchester Gallery has more than 50 member artists so far, including Keith Ramsey and Sir James Thornhill. If it seems like a big promise, Ingram believes it’s worth the risk to promote and support new artists. Joshua Croft’s landscape photos — moody, desolate and arresting — are among the works of Richmond photographers up for sale. A glass-front bookcase displays the published compositions of local writers such as Ethan Evans, author of “Crossroads” (2017) and CDs by area musicians. “We will feature all genres, from gospel to R&B to hip-hop to rock,” says Ingram. “The only type of music we won’t stock is music promoting violence. There’s too much of that in the city.” Additionally, a back room, dubbed the lunchroom, is stocked with computers and records. Why Manchester? The Hull Street corridor is on track for a comeback and come-up, Ingram says. “There’s been a burst of millennials moving to this neighborhood, recent VCU grads who choose to stay in town,” he says, and sweeps his hand toward the construction sites dotting the street. “There are, I believe, seven loft buildings here and they’re building more. 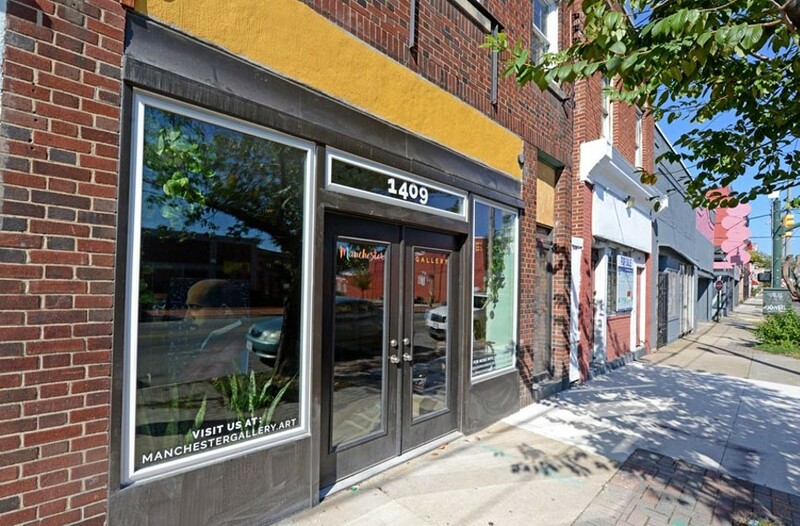 Those people will want accessible culture near them —restaurants, shops and art.” Manchester Gallery will be the latest on the scene to serve the cultural needs of the community, with spaces like the S. Ross Browne Studio having been established for several years. After the gallery settles into its routine, Ingram will commence its second phase: displaying the work of its member artists on both coasts. Manchester Gallery holds a grand opening on Friday, Oct. 20, at 5 p.m. The hours of operation will be 11 a.m. to 7 p.m., Tuesdays through Saturdays (closed Sundays and Mondays). The gallery is seeking artists as members. For information, call 437-9409 or visit manchestergallery.art.